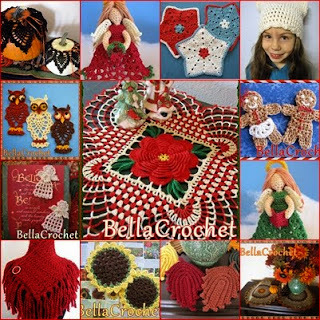 One of the reasons I love the Facebook group Threadies so much is that it gives me the opportunity to meet and get to know other crocheters and designers better. Carol Thompson-Coolbeth was one of the first folks to join the group when it was started a couple of years ago. I loved her lovely, colorful doilies, and was impressed when I learned that she designed many of them herself. When I admired some of the beautiful shaded threads that she used in her doilies, she generously sent me some from her stash. She said she had purchased them years ago, and now only used them for special doilies, as they were no longer available for purchase. I was touched by her kindness, and decided that I, too, would save the thread for a very special project. Last week, I was shocked and saddened to hear of Carol's passing. But, I knew almost immediately that the time had come to use the thread she had sent me, by creating a special doily in Carol's memory. Carol loved to use lots of flowers, butterflies and bright colors in her designs, and her first published design was a double pineapple. I tried to combine these things into a doily that would honor her, using the lovely vintage thread that she had sent me. Carol was an incredibly talented designer. She was always willing to share her vast knowledge of thread crochet by helping anyone who had a question, no matter how small or complicated it was. She added beauty to the world through her designs, her kindness and her generosity. She will be greatly missed. For 3 dc cluster: Yo, insert hook in sp indicated, yo, pull through, yo, pull through 2 lps on hook, (yo, insert hook in same sp, yo, pull through, yo, pull through 2 lps on hook) 2 times, yo, pull through all 4 lps on hook. Rnd 10: Ch 1, (sc, ch 1, 11 dc, ch 1, sc) in each ch-6 sp around, join with sl st in first sc. Rnd 11: Working behind petals, ch 7, (sl st between next 2 petals, ch 7) around, join with sl st in first ch of beg ch-7. Fasten off. Row 12: Working behind petals, join white with sl st in first ch-7 sp, (ch 3, 2 dc, ch 2, 3 dc) in same sp as joining, ch 3, (dc, ch 3, dc) in next ch-7 sp, ch 3, shell (see Special Stitches) in next ch-7 sp; leaving remaining sps unworked, turn. Row 13: Ch 3, shell in ch-2 sp of first shell, ch 3, skip next ch-3 sp, 11 dc in next ch-3 sp, ch 3, skip next ch-3 sp, shell in ch-2 sp of last shell, turn. Row 14: Ch 3, shell in ch-2 sp of first shell, ch 3, skip next ch-3 sp, 2 dc in next dc, (dc in next dc, 2 dc in next dc) 5 times, ch 3, skip next ch-3 sp, shell in ch-2 sp of last shell, turn. Row 15: Ch 3, shell in ch-2 sp of first shell, ch 3, skip next ch-3 sp, dc in next dc, (ch 1, dc in next dc) 16 times, ch 3, skip last ch-3 sp, shell in last shell, turn. Row 16: Ch 3, shell in ch-2 sp of first shell, ch 3, skip next ch-3 sp, (sc in next ch-1 sp, ch 3) 16 times, skip last ch-3 sp, shell in ch-2 sp of last shell, turn. Row 17: Ch 3, shell in ch-2 sp of first shell, ch 3, skip next ch-3 sp, (sc in next ch-3 sp, ch 3) 15 times, skip last ch-3 sp, shell in ch-2 sp of last shell, turn. Row 18: Ch 3, shell in ch-2 sp of first shell, ch 3, skip next ch-3 sp, (sc in next ch-3 sp, ch 3) 14 times, skip last ch-3 sp, shell in ch-2 sp of last shell, turn. Row 19: Ch 3, shell in ch-2 sp of first shell, ch 3, skip next ch-3 sp, (sc in next ch-3 sp, ch 3) 13 times, skip last ch-3 sp, shell in ch-2 sp of last shell, turn. Row 20: Ch 3, shell in ch-2 sp of first shell, ch 3, skip next ch-3 sp, (sc in next ch-3 sp, ch 3) 12 times, skip last ch-3 sp, shell in ch-2 sp of last shell, turn. Row 21: Ch 3, shell in ch-2 sp of first shell, ch 3, skip next ch-3 sp, (sc in next ch-3 sp, ch 3) 11 times, skip last ch-3 sp, shell in ch-2 sp of last shell, turn. Row 22: Ch 3, shell in ch-2 sp of first shell, ch 3, skip next ch-3 sp, (sc in next ch-3 sp, ch 3) 10 times, skip last ch-3 sp, shell in ch-2 sp of last shell, turn. Row 23: Ch 3, shell in ch-2 sp of first shell, ch 3, skip next ch-3 sp, (sc in next ch-3 sp, ch 3) 9 times, skip last ch-3 sp, shell in ch-2 sp of last shell, turn. Row 24: Ch 3, shell in ch-2 sp of first shell, ch 3, skip next ch-3 sp, (sc in next ch-3 sp, ch 3) 8 times, skip last ch-3 sp, shell in ch-2 sp of last shell, turn. Row 25: Ch 3, shell in ch-2 sp of first shell, ch 3, skip next ch-3 sp, (sc in next ch-3 sp, ch 3) 7 times, skip last ch-3 sp, shell in ch-2 sp of last shell, turn. Row 26: Ch 3, shell in ch-2 sp of first shell, ch 3, skip next ch-3 sp, (sc in next ch-3 sp, ch 3) 6 times, skip last ch-3 sp, shell in ch-2 sp of last shell, turn. Row 27: Ch 3, shell in ch-2 sp of first shell, ch 3, skip next ch-3 sp, (sc in next ch-3 sp, ch 3) 5 times, skip last ch-3 sp, shell in ch-2 sp of last shell, turn. Row 28: Ch 3, shell in ch-2 sp of first shell, ch 3, skip next ch-3 sp, (sc in next ch-3 sp, ch 3) 4 times, skip last ch-3 sp, shell in ch-2 sp of last shell, turn. Row 29: Ch 3, shell in ch-2 sp of first shell, ch 3, skip next ch-3 sp, (sc in next ch-3 sp, ch 3) 3 times, skip last ch-3 sp, shell in ch-2 sp of last shell, turn. Row 30: Ch 3, shell in ch-2 sp of first shell, ch 3, skip next ch-3 sp, (sc in next ch-3 sp, ch 3) 2 times, skip last ch-3 sp, shell in ch-2 sp of last shell, turn. Row 31: Ch 3, shell in ch-2 sp of first shell, ch 3, skip next ch-3 sp, sc in next ch-3 sp, ch 3, skip next ch-3 sp, shell in ch-2 sp of last shell, turn. Row 32: Ch 3, shell in ch-2 sp of first shell, shell in ch-2 sp of last shell. Fasten off. NOTE: When working the Edging, you will be working in the ch-3 sps at beginning of rows (these are sometimes called “turning chs”), in the worked ch-2 sps of shells at the ends of rows (these spaces already have the last shell of the next row worked in them--insert hook beside the base of the shell-- see photo) and in the ch-2 sps at the center of the shells on Row 32. C: to work Edging on remaining side of Pineapple (going back toward Center Rose), sc in worked ch-2 sp of next shell, ch 3, *(sc, ch 3, sc) in next ch-3 sp, ch 3, sc in ch sp of next shell; repeat from * across, ch 3, sc in same ch-7 sp on Rnd 11 that last shell was worked in. Fasten off. Row 12: Skip next ch-7 sp on Rnd 11 of Center Rose, working behind petals, join white with sl st in first ch-7 sp, (ch 3, 2 dc, ch 2, 3 dc) in same sp as joining, ch 3, (dc, ch 3, dc) in next ch-7 sp, ch 3, shell in next ch-7 sp; leaving remaining sp unworked, turn. Rows 13-32 and Edging: Work the same as for First Pineapple. Note: Wings are worked in Rounds, forming a circle of 8 small individual wings. Finished Wings will be folded in half length wise, to form 2 layers of 4 wings each. Rnd 2: (Sl st, ch 3, dc, ch 2, 2 dc, ch 1) in first ch-3 sp, (2 dc, ch 2, 2 dc, ch 1) in each remaining ch-3 sp around, join with sl st in top of ch-3. Rnd 3: Sl st into first ch-2 sp, (ch 3, 2 dc, ch 2, 3 dc) in first ch-2 sp, ch 5, skip next ch-1 sp, *(3 dc, ch 2, 3 dc) in next ch- 2 sp, ch 5, skip next ch-1 sp; repeat from * around, join. Rnd 4: Sl st across into first ch-2 sp, ch 5 (counts as first tr, ch 1), (tr, ch 1) 8 times in first ch-2 sp, working over ch-5 sp, sc in first ch-1 sp of Rnd 2, ch 1; *(tr, ch 1) 9 times in next ch-2 sp, working over next ch-5 sp, sc in next ch-1 sp on Rnd 2, ch 1; repeat from * around, join with sl st in 4th ch of ch-5. Fasten off. With shaded purple, (ch 4, 3 dc cluster -see Special Stitches-in fourth ch from hook) 3 times, (ch 9, sl st in 4th ch from hook, sl st in each remaining ch, sl st in top of last 3-dc cluster made) 2 times for antenna. Fasten off. With shaded green, ch 12, (3 tr, picot-see Note-3 tr, ch 4, sl st) in 6th ch from hook, sl st in next ch, ch 9, (3 tr, picot, 3 tr, ch 4, sl st) in 6th ch from hook, sl st in next 3 chs, ch 7, (3 tr, picot, 3 tr, ch 4, sl st) in 6th ch from hook, sl st in next ch, sl st in each remaining ch of beginning ch-12 for stem. Fasten off. Note: When gluing items, it is helpful to place a drop of fabric glue on the tip of a toothpick; use the toothpick to precisely apply glue to desired spot. 1: Place all pieces on blocking surface, folding Butterfly Wings in half to form two layers of 4 wings each. Spray all pieces with spray starch, shape and allow to dry. 2: Glue one Body to each set of Butterfly Wings. Allow to dry. 3: Glue Butterflies to doily as shown in photo. Glue Leaf Sprays to Doily as shown. Allow to dry. Special thanks go to Jewel Fernley and Rosina Smith for testing this pattern. I don't know what I would do without my awesome testers!!!! Copyright BellaCrochet 2016. All rights reserved. Please do not redistribute or share this pattern; do not post it (or any portion of it) on any website. DO NOT make videos or tutorials of it for distribution on YouTube or any other site. You may share the link to the pattern only (and link shares are greatly appreciated, please tell your crocheting friends who might enjoy this pattern!) This pattern has been tested for accuracy and clarity, and I can offer no additional information, photos or help with it. So sorry to hear of Carol's passing. She was a super talented lady. I just know she is smiling as she looks upon us left behind knowing this beautiful doily is named after her. What a beautiful pattern. Thanks for sharing. will definitely be making this. such a beautiful design and the colors r vibrant. i especially like the butterflies.